OK, I don't know what it called in Chinese yet. I frequently go little restaurant near my house (open 24 hours!) and have something like this. On the left is "wah guay" (sounds a little like "walk away"). 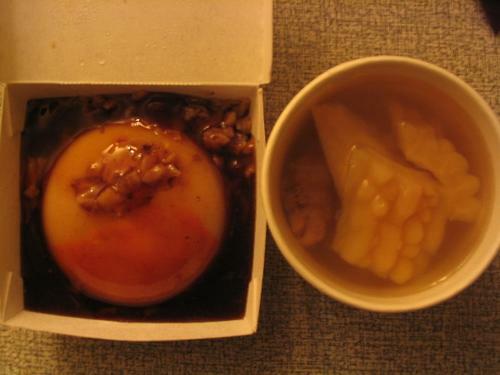 It's a rice custard-like thing with meat inside. It is steamed in a bowl, then flipped onto a plate with some pickled mustard greens, and a gravy-like sauce. I like a little hot sauce on mine. On the right is bitter melon soup--an acquired taste, most say. It's not as bitter as other bitter melon soups I have had. Delicous, and the owner knows me and tries to teach me a little Taiwanese. Total cost: about: US$1.50.